This group is suitable for people who have already a substantial knowledge of French, but wish to improve on their fluency. This course will focus mainly on conversational skills, and you can expect the lessons to be conducted in French (though, on occasion, I might use English to quickly explain a finer grammar point!). Various themes will be explored, thanks to different means: articles from the internet or form the French press will help gather vocabulary that will prove extremely useful for discussion, and, although grammar will not be formally explored, we will look at those aspects that you feel less confident about. The course will help you feel more confident whilst discussing a number of topics that come up in conversation with friends, or with colleagues. I will integrate some film extracts in order to improve your fluency and develop further your understanding of more colloquial French, as well as other cultural elements. 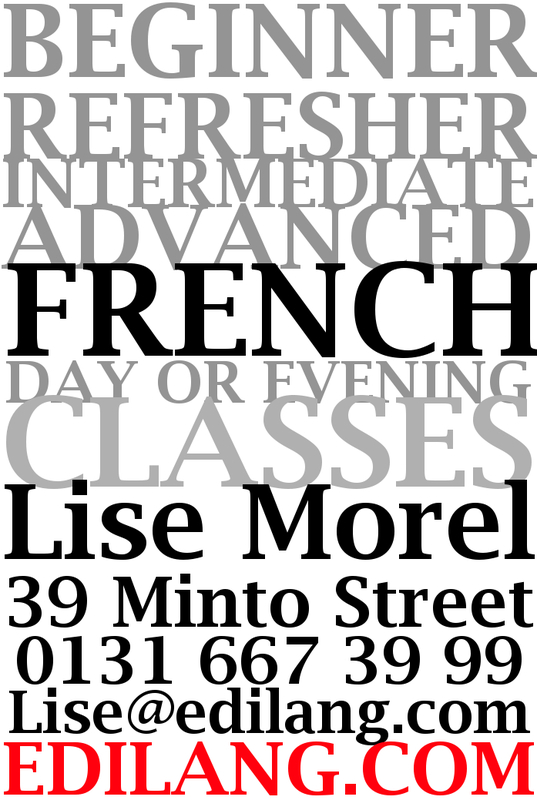 Contact Lise today to check if this is the right class for you: Free 30 minutes assessment of your present level! Classes start on the 11 of October 2010 and will last for 10 weeks, until the middle of December. For more information and for a free assessment of your level to determine if this is the right group for you, contact Lise at lise@edilang.com or on (0131) 557 27 34.